Drawing from the collection of alumna Amrita Jhaveri '91 and with funding by Jindal South West, Brown University will exhibit the work of Maqbool Fida Husain, one of India's more recognized living painters. At ninety-four years old, M.F. Husain has made a significant contribution to the art community of India and abroad. Inspired by the work of Pablo Picasso, he has often been credited with bringing modernism and other western styles to the east. Perhaps one of the biggest highlights of his career occurred in 1971 when just Husain and Picasso were asked to create and exhibit their work for the Bienel de Sao Paulo. The exhibition spans Husain's artistic career from 1954 through 1971, a time frame that shows him in the peak of his career. Some of his subjects include street life, horses, religion, mythology, and women. In the early 1970s, some of his work melded his love of the female together with Hindu deities to create images that were later deemed provocative and defacing of Hinduism. Unfortunately because of this work and fearing for his life, he was driven out of India in the 1990s. Despite living abroad in Dubai and London, he has remained a fixture on the Indian art scene and many people have asked for him to be honored with the Bharat Ratna, India's highest civilian award. The exhibition is presented by Brown University's Year of India, the Cogut Center for the Humanities, and the David Winton Bell Gallery at Pembroke Hall. 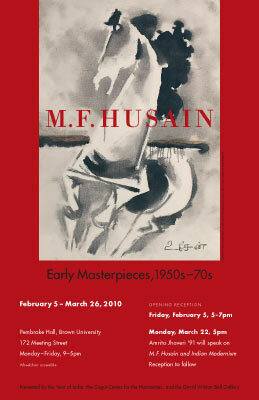 It begins with a reception on Friday, Feb. 5, 2010, from 5 to 7pm, and continues until March 25, 2010. The Providence Journal has written a review of the exhibit and the life of M.F. Husain. Malcolm Grear Designers created the invitation, exhibition poster, and installation graphics for the exhibition.